We get it: Sometimes there’s just no time to prep all your lunches and dinners for the week, but it’s easy to prepare nutritious snacks to get you through the busiest of days. These grab-and-go snack boxes are easy to put together and hearty enough to pass for a regular meal, or snack on them throughout the day. Each one is loaded with protein, fiber, and flavorful ingredients to satisfy your taste buds and that midafternoon rumble in your tummy. 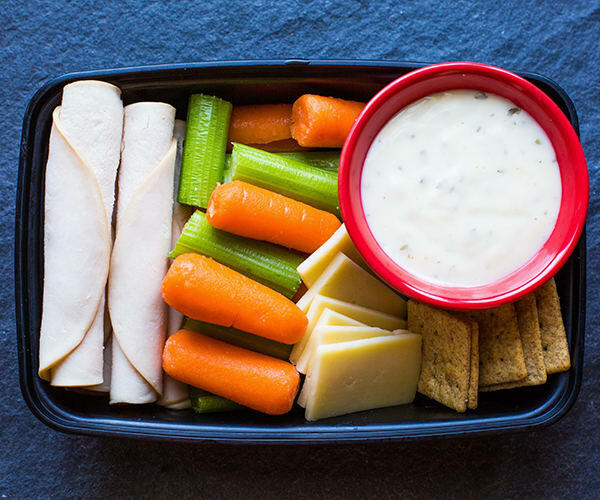 Snacking on good old cheese and crackers and veggies with ranch dressing will please any kid — or grown-up kid. Our Healthier Ranch Dressing recipe made with Greek yogurt, low-fat buttermilk, and dried herbs is so much healthier and lower in calories than the goop that comes in a bottle — and one serving of our Healthier Ranch Dressing is a full ¼ cup! Dunk those baby carrots and celery sticks to your heart’s content. Rolled up slices of lean deli turkey add 15 grams of protein to keep you feeling full. The slogan is right: You can’t eat just one chip. Salty chips can be a snacker’s downfall, but these healthy Baked Corn Tortilla Chips are Beachbody-approved! They’re brushed with a teaspoon of olive oil and baked until crisp. 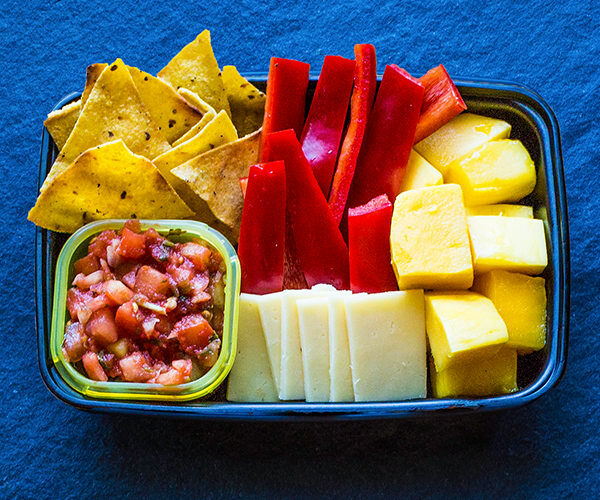 We paired them with fresh pico de gallo salsa and cheese so you can build your own nachos. Crunchy red pepper slices and chunks of sweet mango provide vitamin C and full servings of fruits and vegetables. Portion Fix Containers: 1 Green, 1 Purple, 1 Yellow, 1 Blue, 1 tsp. The West Coast has a reputation for being obsessed with kale and wholesome junk-food alternatives like these roasted chickpeas — and it’s, like, totally true. 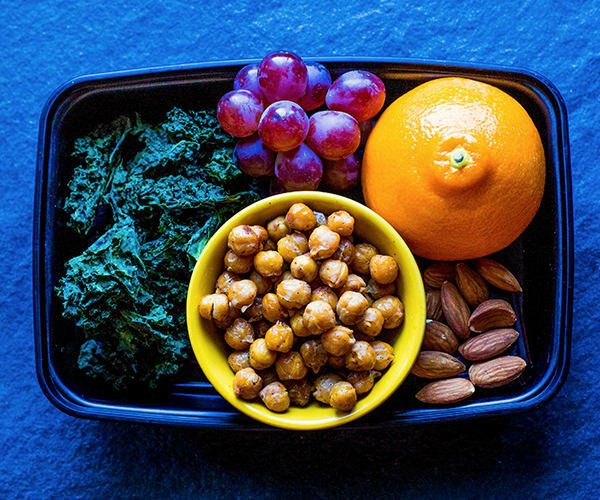 Throw in some raw almonds, grapes, and clementines, and you’ve got a vegan snack box with more than 12 grams of protein. To roast the chickpeas: Drain, rinse, and pat dry one 15-oz. can of chickpeas. Spread chickpeas on a baking sheet sprayed with nonstick cooking oil and drizzle with 2 tsp. olive oil; add salt and pepper to taste. Bake in an oven heated to 425°F for 12 to 18 minutes, or until lightly browned and crisp. Makes three servings, ½ cup each. 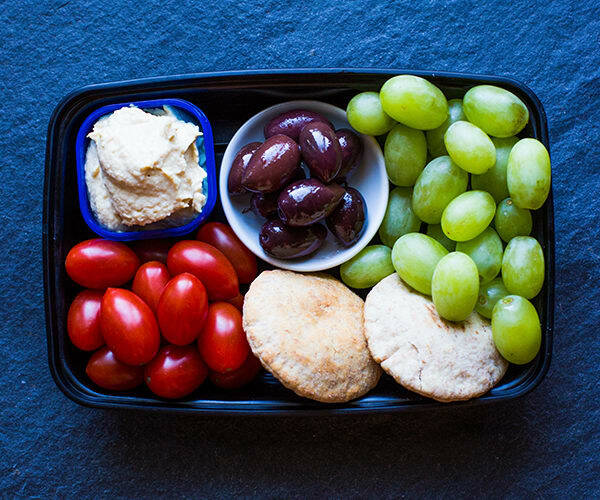 Will this snack box filled with hummus, kalamata olives, pita bread, and juicy grapes and tomatoes make you feel like you’ve been whisked away to a Mediterranean island? Probably not, but foods like these have plenty of omega-3s and fiber to fill you up between meals. Make snack time even better with this super simple recipe for Homemade Hummus. 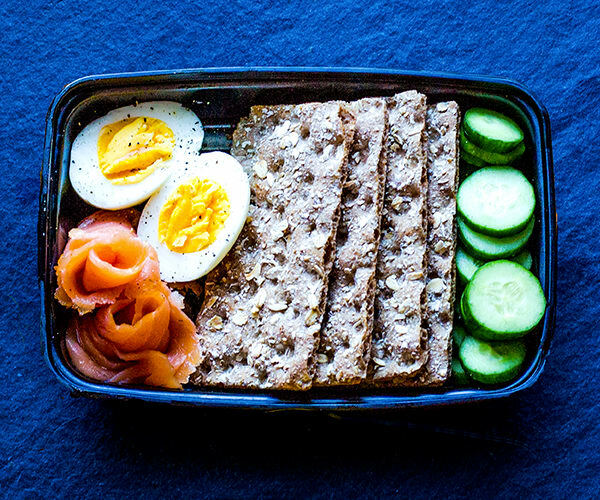 For a delicious, Scandinavian-style snack, layer velvety lox or smoked salmon with hard-boiled eggs and cucumber slices on Wasa crackers. Look for whole-grain crispbreads with extra fiber for a satisfying snack that is hearty enough to be lunch or dinner.